Mega Man (known in Japan as Rockman) is a robot created by Dr. Light and the titular protagonist of the Mega Man video game series. Originally created to be Light's lab assistant, Dr. Wily taking over six of Light's robots led Mega Man to be converted into a battle robot to fight Wily and stop him from taking over the world as well as achieve everlasting peace. In the Mario franchise, Mega Man has made appearances in the Club Nintendo comics and cameos as unlockable costumes that his amiibo can unlock, and he is a playable third-party guest character in Super Smash Bros. for Nintendo 3DS / Wii U and Super Smash Bros. Ultimate. Mega Man, Dr. Light and Mario trying to catch Wario in "Super Mario: Die Verwandlung"
Mega Man's first appearance in Mario-related media is in the German Club Nintendo magazine comic "Super Mario: Die Bescherung". The comic shows him with several other characters at Mario and Luigi's Christmas party. His first and only major appearance was in the 1993 comic "Super Mario: Die Verwandlung", where he serves as Dr. Light's assistant. Toward the beginning Mega Man is the one that lets Mario into Dr. Light's home and guides him to his lab, making fun of Mario wearing a plastic bag to cover his pixelated head. Later, when Dr. Light confuses Mario's pixels for pimples, Mega Man appears and recommends "Oil of Mega Man". Finally, when Wario breaks out of the lab, Mega Man is the one driving the car they are chasing him in. Mega Man is also mentioned in the comic "Super Mario: Mario im Wunderland". When Mario and Toad meet Kirby, the latter explains that he wants to see the wizard so that he can wish to look like Mega Man. 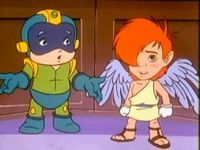 Mega Man (left) next to Kid Icarus (right). 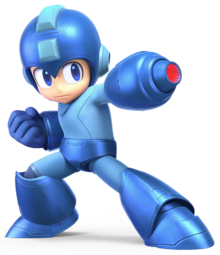 Mega Man appeared as a recurring character in the American television series, Captain N: The Game Master. Mega Man teleports onto the stage in a similar manner to the Mega Man games. Mega Man's first appearance in first-party Mario-related media is as a playable guest character in Super Smash Bros. for Nintendo 3DS and Super Smash Bros. for Wii U, as well as the third third-party character to be confirmed as a playable character in the series. Mega Man's appearance and aesthetics in this game are based on his appearance in the NES titles, possessing a moveset centered around shooting as his opponents; he can use the Mega Buster to fire multiple single shots as his standard attack, which can be used while both walking and jumping, and use the Charge Shot as a side smash attack. His only direct attacks are the slide as his strong down attack, which made its debut in Mega Man 3, and the Mega Upper as his strong up, a move introduced in Mega Man 2: The Power Fighters which later appeared in Marvel vs. Capcom. Much of Mega Man's moveset is based around the special weapons (referred to as the "Variable Weapon System") obtainable from the various Robot Masters in the classic Mega Man series. His special moves include Metal Blade, Crash Bomber, and Leaf Shield from Mega Man 2 as his standard special, side special, and down special respectively, and Rush Coil from Mega Man 3 as his up special. His dash attack is the Top Spin, a move from Mega Man 3 which can hit multiple times. His up smash is the Spark Shock and his down smash is the Flame Blast, from Mega Man 3 and Mega Man 6, respectively. His aerial attacks include Slash Claw from Mega Man 7 as his back air, Flame Sword from Mega Man 8 as his front air, Air Shooter from Mega Man 2 as his up air which sends a tornado into the air that pushes opponents up, and Hard Knuckle from Mega Man 3 as his down air which acts as a meteor smash. His grab is the Super Arm from the original Mega Man. His Final Smash is Mega Legends, which involves the other incarnations of the Mega Man character appearing alongside this one to blast opponents all at once. 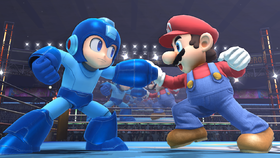 Mega Man returns as an unlockable playable fighter in Super Smash Bros. Ultimate. His Final Smash now incorporates Proto Man and Bass, but otherwise functions the same as before. His Mega Buster can fire farther than the previous installment, improving some of his moves. Mega Man benefits from universal changes: his mobility is faster, his short hop timing is reduced, his aerials have less landing lag, he can directionally air dodge, and he can use any ground attack out of a run and any aerial attack on a ladder. Unlike most other routes, the Bonus Game in Mega Man's Classic Mode route takes place between Rounds 5 and 6. Metal Blade is Mega Man's standard special move, originating from Mega Man 2 as the weapon obtained by defeating Metal Man. 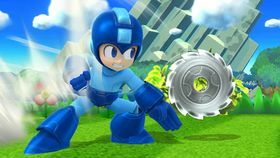 When used, Mega Man throws a metal sawblade that deals little damage at opponents. Like the game of origin the Metal Blade can be thrown in eight directions by tapping the control stick in the corresponding direction after pressing the special attack button, but only one can be thrown at a time. The Metal Blade also acts like an item in that other players can pick up and throw a Metal Blade. The first custom variant for this move in Super Smash Bros. for Nintendo 3DS and Super Smash Bros. for Wii U is Hyper Bomb, Bomb Man's weapon in the original Mega Man. 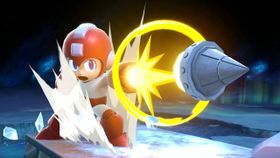 When used, Mega Man throws a bomb at an arc in the direction he is facing that damages opponents on contact, and explodes as soon as it hits ground. The second variant is Shadow Blade, Shadow Man's weapon from Mega Man 3. Mega Man throws a shuriken at opponents that travels a set distance before returning to him, allowing for multiple hits; while it can be thrown in eight directions, it cannot be picked up by opponents, as the Shadow Blade disappears as soon as it hits a wall or the ground. One of Mega Man's alternate color schemes is that of the palette he gains when using the Metal Blades in Mega Man 2, and another is similar to the colors he gains when using Hyper Bomb in the original Mega Man. Crash Bomber is Mega Man's side special move. Originally Crash Man's weapon from Mega Man 2, it can be used by holding the control stick to the sides and pressing the special attack button. When used, Mega Man fires a bomb that travels across the screen. When it hits an opponent or a wall, it behaves like a Gooey Bomb, sticking to them for a few seconds before detonating; it can also be passed to other players by running into them. Mega Man can only shoot one Crash Bomber at a time. The first of Mega Man's custom versions of this move in Super Smash Bros. for Nintendo 3DS and Super Smash Bros. for Wii U is Ice Slasher, Ice Man's weapon from the original Mega Man. When used, Mega Man shoots an ice projectile across the screen that can freeze opponents. The other variant of this move is Danger Wrap, Burst Man's weapon from Mega Man 7, which has Mega Man fire a bomb inside a bubble that arcs up after firing. Rush Coil is Mega Man's up special move. First appearing as one of Rush's abilities in Mega Man 3, it has since become a staple throughout the classic Mega Man series. When used, Mega Man summons Rush to launch him into the air using a spring on his back. 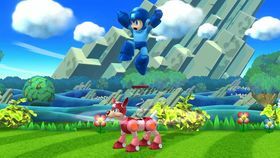 If Rush is summoned on the ground, Mega Man can spring off of him a second time for a second, higher jump; however, other fighters may also jump on Rush while he is summoned. In Super Smash Bros. for Nintendo 3DS and Super Smash Bros. for Wii U, the first custom variant for this move is Tornado Hold, the special weapon obtained for defeating Tengu Man in Mega Man 8. When used, Mega Man creates a tornado that launches him into the air and damages nearby opponents. The second variant for this move is Beat, another recurring character in the Mega Man series starting with Mega Man 5; when used, Mega Man summons Beat to carry him into the air for a limited time; Mega Man can also move from side to side while flying, but cannot stop flying once Beat has been used. Leaf Shield is Mega Man's down special move, originally appearing as Wood Man's special weapon in Mega Man 2. 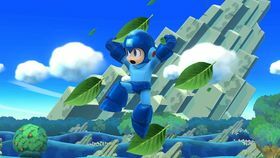 When used, Mega Man creates a barrier of four leaves around himself that can protect him for a limited time. Like in the game of origin, Mega Man can also throw the shield to attack opponents. When the barrier is attacked, the leaves disappear one at a time. In Super Smash Bros. for Nintendo 3DS and Super Smash Bros. for Wii U, the first custom variant of this move is Skull Barrier, Skull Man's special weapon in Mega Man 4. When this move is used, Mega Man creates a barrier of flaming skulls that reflect projectiles, though the barrier does not last as long. The second variant is Plant Barrier, the weapon obtained from Plant Man in Mega Man 6; Mega Man creates a barrier of petals around him that provide greater defense, though it does not travel as far when thrown. Mega Legends is Mega Man's Final Smash. After breaking a Smash Ball and activating the Final Smash, Mega Man fires a Black Hole Bomb, Galaxy Man's weapon from Mega Man 9, which travels across the screen and opens automatically once it reaches a short distance. The Black Hole is wide and draws in opponents, but if no opponents are in range, the attack fails. 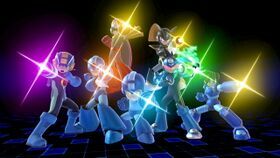 The trapped opponents are brought to a cutscene where Mega Man, Mega Man X, MegaMan.EXE, Mega Man Volnutt, and the Mega Man from Mega Man Star Force fire a continuous stream of lasers at the opponents, dealing massive damage. At the end of the attack, the opponents are launched and Mega Man returns to the battlefield. Additionally, if the opponents have taken enough damage, the Black Hole launches them instantly without going through the cutscene. In Super Smash Bros. Ultimate, Proto Man and Bass join the group for the Final Smash. By scanning the Mega Man amiibo on the GamePad while playing Mario Kart 8 and Mario Kart 8 Deluxe, a special Mii racing suit designed after the character will be unlocked. A sample of this suit is shown right next to a picture of Mega Man on the Mii Racing Suits screen, which is located in the main menu of the game; thus, Mega Man makes his first cameo appearance within a Mario game. These features are only present as of version 4.0 of the aforementioned game. Players can unlock a Mega Man amiibo design for Yoshi in Yoshi's Woolly World and Poochy & Yoshi's Woolly World by scanning Mega Man's amiibo. Mega Man's amiibo can be used to unlock a Mega Man costume for use as Costume Mario in Super Mario Maker. His sprite is similar to his 8-bit sprite from the Mega Man series, but scaled down to fit the size of Small Mario. As with all other Costume Mario costumes, can only be used in the Super Mario Bros. graphical style. Mega Man's transformation sound is the level select sound from Mega Man 2, and while he has no jumping sound effect, his landing and death sounds are the ones throughout the Mega Man series, and pressing up on the d-pad causes him to hold out the Mega Buster, which also plays the sound for firing a shot in the Mega Man series. Finally, his level clear song is from Mega Man 2. His running and jumping animations are based on those used in the Mega Man series, and his stopping sprite is based on his sliding sprite first seen in Mega Man 3. NES Mega Man 2 (07/1989) The main hero from Capcom's 1987 action game, Mega Man. He travels from stage to stage, defeating Robot Masters to obtain new weapons. He uses this vast arsenal in Smash Bros. in a variety of ways. Metal Blades, for example, can be fired in eight directions and picked up off the ground! NES Mega Man 2 (07/1989) Mega Man has more than 10 different weapons at his disposal. His forward air attack, Flame Sword, affects a wide area and doesn't leave much of an opening, making it useful in a variety of situations. His Leaf Shield special spins four leaves around him to deflect projectiles or hurt foes. He can also fire the leaves forward. Viridi: Hey, look! It's Mega Man! Pit: Is that really him? It is really him! WOW! Viridi: I hope he busts out his Mega Buster! Pit: I wanna see his Charge Shot! The main hero from Capcom's Mega Man series. An advanced humanoid robot created by Dr. Light, Mega Man was modified from a general-purpose lab assistant into a fighting robot. Fitted with a powerful arm cannon and the ability to gain skills from defeated enemies, Mega Man serves to thwart the evil plans of Dr. Wily and protect the peaceful coexistence between robots and mankind. Mega Man series creator Keiji Inafune took some level of inspiration from the Super Mario games when designing this series. Mario appears in a French commercial for Mega Man 2. In the character's backstory, the helper robot was originally named Rock before being converted into the super fighting robot, Mega Man; however, in the North American version of Super Smash Bros. for Wii U, Dr. Light's trophy description instead suggests that he was formerly known as Mega, which is a nickname only used as his initial designation as an assistant in the PlayStation Portable remake Mega Man Powered Up. This is generally considered a localization error as Mega does not match his sister Roll (as in rock and roll), and is corrected to Rock in the PAL version. ↑ Keiji Inafune on the Mega Man Knowledge Base. This page was last edited on March 16, 2019, at 12:35.